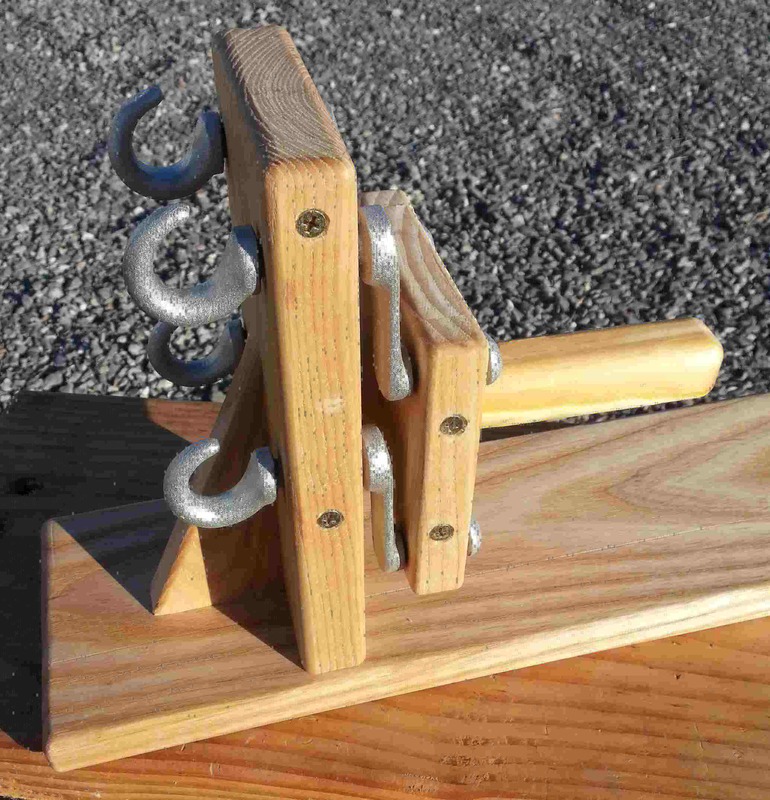 A reproduction of the Martin Meyer (patent of 1924) four strand hook rope machine. This machine is non-geared. The strand hook and attached arms are cast in aluminum versus the original steel. The arms are set about three inches apart in the hardwood frame. This machine can be used for making three or four strand rope. This unit is non-geared, so one turn of the handle is one turn of the strand hooks. So the turning becomes more controlled, and the yarns (string, twine, etc) forming the strands are less like to jump around as with the Bucklin (patented 1901) geared rope machine. (Price also less than half that of a good quality Bucklin). All rope machines of the early 1900s vintage need to be attached to a table, sawhorse, or column for operation. For this reproduction Meyer machine, I use a specific purpose sawhorse that I put ballast on a shelf in the bottom section. Suggestions are included with the kit instructions about attaching the machine to a base. 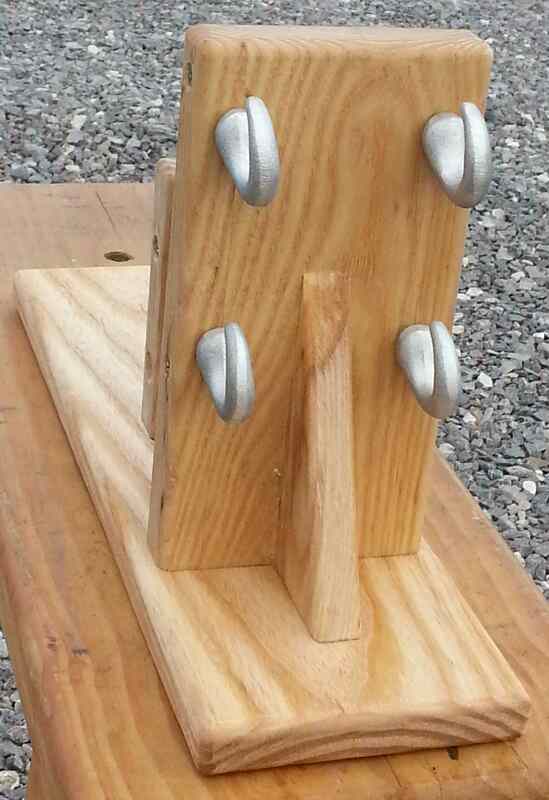 When working on slick floors, the sawhorse may need 60+ pounds of ballast when making ropes 3/4th inch or larger in diameter, to keep the sawhorse from being drug across the floor while making rope, else set the sawhorse on a rubber mat. Working on driveways or yards, the ballast requirement drops significantly, because of the increased surface friction. 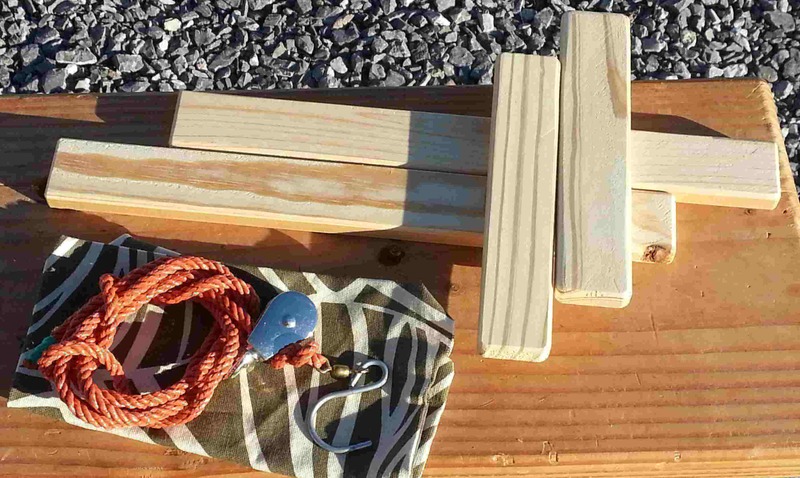 The M2K Rope machine kit is composed of the rope machine, two cross shaped rope tools, and the pulley traveler kit. Shipping weight is about six pounds, as shown below. See Parts Ordering Page for ordering information. The machine can be adapted to different mounting options such as mounting to a fence rail. This has been a particular concern for museum groups. Contact us to discuss your requirements.